Vickie Mays, Director of the BRITE Center, is a Professor in the Department of Psychology in the College of Letters and Sciences, as well as a Professor in the Department of Health Services. 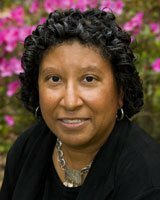 She teaches courses on the health status and health behaviors of racial and ethnic minority groups; research ethics in biomedical and behavioral research in racial/ethnic minority populations; research methods in minority research; as well as courses on the social determinants of mental disorders and psychopathology. She holds a PhD in clinical psychology and an MSPH in health services, with postdoctoral training in psychiatric epidemiology, survey research as it applies to ethnic minorities (University of Michigan) and health policy (RAND). Professor Mays’ research primarily focuses on the mental and physical health disparities affecting racial and ethnic minority populations. She has a long history of research and policy development in the area of contextual factors that surround HIV/AIDS in racial and ethnic minorities. This work ranges from looking at barriers to education and services to understanding racial-based immunological differences that may contribute to health outcome disparities. Her research also includes looking at the role of perceived and actual discrimination on mental and physical health outcomes, particularly as these factors impact downstream disease outcomes. Her mental health research examines the availability, access and quality of mental health services for racial, ethnic and sexual minorities. She is the co-PI of the California Quality of Life Survey, a population-based study of over 2,200 Californians on the prevalence of mental health disorders and the contextual factors associated with those disorders. Dr. Mays has provided testimony to a number of congressional committees on her HIV, mental health and health disparities research findings. She recently completed a term as the chair of the Subcommittee on Populations of the National Committee on Vital and Health Statistics. In that position she helped develop a report on the role of data collection in reducing health disparities associated with race, ethnicity and primary language. She has received a number of awards including one for her lifetime research on women and HIV from AMFAR, a Women and Leadership Award from the American Psychological Association and several Distinguished Contributions to Research awards. Dr. Mays has served as a PI of multi-million dollar grants, and has managed project staffs as large as 16 and responsibility for budget and personnel, all while achieving her project’s scientific goals. She served a four-year term, with one year as vice-chair, on the UCLA Institutional Review Board. In 1997 she was elected vice chair of the Academic Senate, the highest-ranking administrative faculty position. As chair for a three year term (1998-1999), she had oversight responsibilities for 22 committees including Planning and Budget, Undergraduate and Graduate Council, Faculty Welfare and Research. She was responsible for the preparation of the senate budget of approximately $1 million in operating costs and another $1 million funding the faculty grants program and the 15-person staff. During her tenure as the senate chair she managed to successfully double funds received from the UCLA Foundation as a contribution to the Faculty Grants Program. She was a member of the Chancellor’s Committee on Diversity, the Steering Team of the university’s outreach efforts to increase minority student enrollment, and drafted the campus response on faculty intellectual property considerations in teaching, research, and creative endeavors. Prior to her election as the chair of the Academic Senate, Dr. Mays served on three committees that were an integral part of the university’s efforts to overhaul the budget process. Among the Responsibility Center Management ad hoc committees, she served on cost allocation, customer service and the overall coordinating committee. In 1998 she was selected to attend a six-day UC Management Institute focused on negotiation skills, ethical business practices, and the overall functioning of the UC system. These experiences have given Dr. Mays an excellent knowledgebase of how the university functions, how resource allocation occur and how to successfully navigate the university system. Equally important is the fact that she has established a number of working relationships with both administrators and faculty across campus that will benefit the Center. Scan the image above with your smartphone to take this info with you!